Seoul, 27 Oct. 2010 — Universiti Kebangsaan Malaysia (UKM) never use ranking as an absolute measure of quality as the indicators used capture a narrow range of what the university as a complex organization does, its Vice Chancellor, Prof Tan Sri Sharifah Hapsah Sahabudin said here today. Instead, UKM uses a wide range of key performance indicators (KPI), covered under five pillars of excellence, namely governance, leadership, academia, teaching and learning and research and innovation. These KPIs are benchmarked with international good practices. Prof Tan Sri Sharifah Hapsah was presenting a paper entitled The new accountability culture: rationale, measures and challenges for higher education in Malaysia at the 2nd ASEM Rectors’ Conference, themed “Asia-Europe University Cooperation: Contributing to the Global Knowledge Society”. The conference is organised through the joint efforts of the ASEM Education Hub (AEH) under the auspices of the Asia-Europe Foundation (ASEF), Korea University (KU) and the ASEAN University Network (AUN) on 26-27 October, 2010 in Seoul, Korea. Prof Tan Sri Sharifah said, traditional accountability as conducted annually by the auditor and reported to parliament focuses on compliance with international accounting and finance procedures, adherence to rules and regulations to avoid extravagance, wastage and abuse of taxpayers’ money. In the mid 1990s, Malaysia embarked on liberalization, democratization and privatisation to increase access to higher education and to check the net outflow of revenue by also attracting international students to study in Malaysia. In making Malaysia an education hub, quality assurance was an essential feature of accountability to students, parents and other stakeholders. It was initially applied to private higher education institutions (HEIs) through the National Accreditation Board Act and later expanded to cover all HEIs under the Malaysian Qualifications Agency (MQA) Act. The MQA Act makes it mandatory for HEIs, either through a self accrediting mechanism or an external evaluation by the MQA, to ensure that all programmes are delivered at standards where they can be entered into the Malaysian Qualifications Register. The research university audit was introduced in 2006 to identify universities that can further the national agenda for a competitive economy and social wellbeing through R&D, innovation and commercialisation. The four universities that were given research university status were given considerable additional annual grants. They are audited every three years to maintain the status. By the mid 2000s when world university ranking became fashionable and naively associated with quality and excellence, there was great obsession to get at least 2 Malaysian universities into the top 100. It was only in 2009 that it was agreed that autonomy was necessary for making greater strides towards excellence. However autonomy has to be “earned” whereby the government is willing to grant greater autonomy provided higher education institutions demonstrate good governance (institutional, financial, human resource and academic governance). A code of good university governance is being developed, from which will be derived the university good governance index as a measure of the readiness of universities to be granted autonomy. Tan Sri Sharifah Hapsah highlighted the issues of overlapping criteria, insufficient clarity about the information that is required, inadequately trained auditors and the amount of time, energy and resources that have to be invested in complying to the requirements of the various auditing agencies and departments. She emphasised the need for dialogue and cooperation of all stakeholders in developing the measures and for HEIs not to be distracted by performance indicators set by central agencies or ranking bodies. Instead she advised HEIs to develop their own strategic plans with performance indicators that are designed to achieve the university’s vision and mission. These KPIs should be benchmarked with international good practices. The KPIs demanded by external auditing bodies should be incorporated in the HEI’s plan. In this way HEIs will attain excellence in a systematic way rather than play to the ranking or accountability game. The accountability culture should support the university’s overall strategic plan for service to humanity. At the institutional level, the leadership must drive the accountability culture and inspire others to buy-in through multilevel awareness workshops and training activities. Sufficient budget and staff must be allocated for accountability audits, as well as incentives and rewards for the time and energy invested by faculty and staff on these activities. More importantly organizational changes must be made to support the accountability culture. Prof Tan Sri Sharifah said the work is hard but the dividends derived are great. This include pride in achievement, international recognition, collaboration and increased research grant, accreditation, and student mobility. Additionally, there will be stakeholder confidence through image and branding and elevation of reputation and most importantly, autonomy. The 2nd Asia-Europe Meeting (ASEM) Rectors’ Conference which was opened in Seoul yesterday aims at strengthening academic cooperation among higher education institutions of the 46 member countries of the Asia-Europe Meeting (ASEM). The ASEM Rectors’ Conference is a biennial meeting between the heads of higher education institutions. 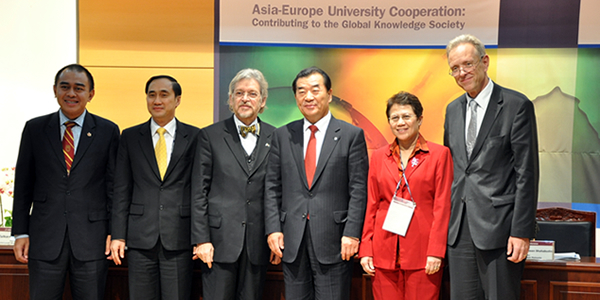 The 2nd ASEM Rectors’ Conference, “Asia-Europe University Cooperation: Contributing to the Global Knowledge Society”, attracted more than 80 higher-education experts. It is organised by the Asia-Europe Foundation (ASEF), Korea University (KU) and the ASEAN University Network (AUN). Education was included as a priority agenda for leaders of the ASEM during the 6th ASEM Summit in Helsinki 2006. The growing level of interdependence between regions in the areas of research and higher education has made interregional dialogue particularly relevant. Furthermore, fostering cooperation between universities in Asia and Europe can contribute to defining the role of higher education in a globalised society. Further development of the ASEM education process and an exchange of ideas on relevant trends on higher education will be examined at the conference. 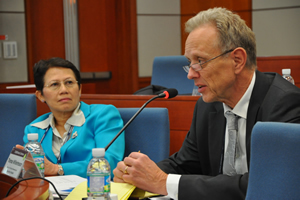 The AUN has undertaken a wide range of activities both within and beyond ASEAN. It has substantially increased cooperation in higher education between Asia and Europe, including support for the 2nd ASEM Rectors’ Conference. The ASEM Rectors’ Conference was first organised in 2008 by ASEF in response to the 1st Asia-Europe Meeting of Ministers for Education (Berlin 2008)’s call for structural education cooperation among ASEM partners.